Gilraen shifted restlessly, trying vainly to find a comfortable position against the pillows. The babe within her kicked vigorously. Gilraen patted her swollen belly. Her child seemed as uneasy as she was tonight. If only she could rest, but so many anxious thoughts were whirling around her mind that sleep seemed impossible despite her weariness. Always she fretted when Arathorn was out on patrol. He had not wanted to leave her so near her time, but she had reassured him that she would fare well enough. It were not as if she were alone. She had her mother visiting who would take care of her. He had his duty to his people. That was the lot of the womenfolk, to smile as they waved their men goodbye and hide the dread within their hearts that each farewell would be a final one. Then, as the time for the baby to be born drew near, Gilraen became increasingly apprehensive. Would the baby be healthy? Would it be the son that her husband and their people so longed for? Much as she desired this child, she feared for herself. Childbirth was a perilous thing for a woman. Would she survive the birth to care for her little one? Gilraen winced as the baby gave her a sharp jab in the ribs. Gilraen started as her mother who was lying beside her, yawned and sat up. Ivorwen picked up her shawl and wrapped it around her. She took a log from the basket on the hearth and threw it on to the fire. It flared up, filling the room with a comforting red glow. “Do not fret about me, child. I will be back in a moment with the tea,” she said. Gilraen sat up and settled herself against the pillows. She stared into the fire trying to see pictures there, something she had not done since she was a little girl. Gilraen reached out to take her drink and grimaced as the baby kicked her in the ribs again. “I know it is uncomfortable, my love, but the child is getting into the right position to be born,” Ivorwen said sympathetically. Gilraen took a sip of her tea and smiled. Her mother had added honey. “Do you remember me sweetening the medicines the healer gave you for those winter coughs you had as a child?” Ivorwen asked. “You must have heard it a hundred times!” Ivorwen chuckled. Ivorwen climbed back into bed and Gilraen nestled her head against her mother’s shoulder just as she used to do when, as a little girl, her mother would tell her a bedtime story, after tucking her in for the night. “Yet we survived,” said Gilraen. Gilraen closed her eyes. “I can almost smell the perfume!” she said. “Every farmer knows that is how to ensure another year’s harvest,” Gilraen remarked. “But he did indeed pluck the precious fruit,” said Gilraen. Ivorwen took another sip of tea and then placed the almost empty cup on the bedside table. “He did indeed. You know this story as well as I do, child.” Her tone was half chiding, half amused. “Just like my Arathorn,” Gilraen said, her tone full of pride. “I love that part of the story,” said Gilraen. Gilraen shuddered. “Hearing of such evil deeds makes my blood run cold,” she said. “Alas, that it is no more!” said Gilraen. A sudden light of farsight came into Ivorwen’s eyes. “The tree will bloom again in the Court of the Fountain!” she said. The child within Gilraen’s womb kicked vigorously. Gilraen flinched, and then she smiled and guided her mother’s hand so she could feel the pressure of the tiny foot. “The babe likes your words,” she said. Gilraen stared at her mother. For a moment, gone was the familiar comforting mother she knew, and in her place was a queen of old, the light of prophecy in her eyes. Then Ivorwen laughed and was again the mother she had always known and loved. “The horses can go no further!” cried Elladan, striving to make himself heard over the thunder of hoof beats. “We must press on and get the child to safety,” replied Elrohir. “How can we do that if the horses collapse and he and his mother fall from the saddle?” his brother replied. Gilraen stumbled from the saddle, accepting Elladan’s supporting arm as her numbed limbs regained their feeling. The sons of Elrond then stood aside to allow the young widow some privacy as she stretched her legs. They offered to take the child from her arms, but she declined and hugged him fiercely to her. Gilraen paced the clearing while the horses drank from a nearby stream. She wanted to weep and rage, but did not. What purpose would it serve? It would not bring Arathorn back to her, nor would tears make it safe to stay amongst her family and friends. Aragorn stirred in his sleep. Gilraen studied his innocent features, her heart brimming with love and grief. What future awaited her precious son, fatherless and torn from his home? He was only two years old and forced into exile. A sudden memory came back to her of the night her mother had told her the story of Isildur and the White Tree. Was she not like her forefather now, carrying the seed of her people’s hopes to safety? Isildur had been sore wounded in body, while she was sore wounded in spirit. 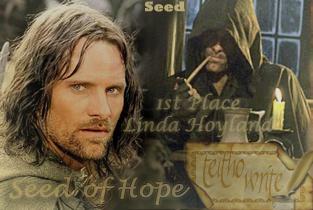 But Isildur had prevailed and preserved the precious seed and so would she. Filled with a new strength and resolve that Aragorn should flourish just like the seedling of Nimloth, Gilraen walked back to where the sons of Elrond were waiting to take her and her son to a new life. A/n. This story was written for the Teitho “Seeds” challenge where it was placed first.